Tank setup: Fairly large tank required if more than one kept, with refuges for females and gentle circulation. Compatibility: Community, but males may be aggressive. Feeding: Omnivore: feed flake, frozen and live foods. 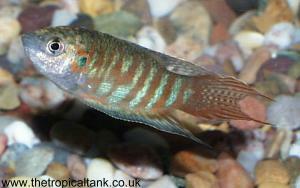 Sexing: Males have brighter colours and much longer fins than females. Breeding: Bubble nest builder. Eggs hatch in about a day and are usually guarded by the male. Comments: Several colour forms of this species exist.